Another release in our highly successful Jukebox Hits series. 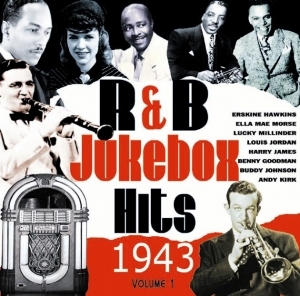 The R&B charts had been in existence for a full year in 1943, and this volume charts the biggest hits of the year. The track listing shows the diversity of tastes across America and it is interesting to note that white artists such as Frank Sinatra and the big bands of Harry James and Tommy Dorsey were equally popular with Black audiences; equally black artists enjoyed a growing popularity amongst white audiences. Artists include Sinatra, Louis Jordan, Benny Goodman, Lionel Hampton, Ella, and indeed it is a veritable ?who?s who? of contemporary American popular music.